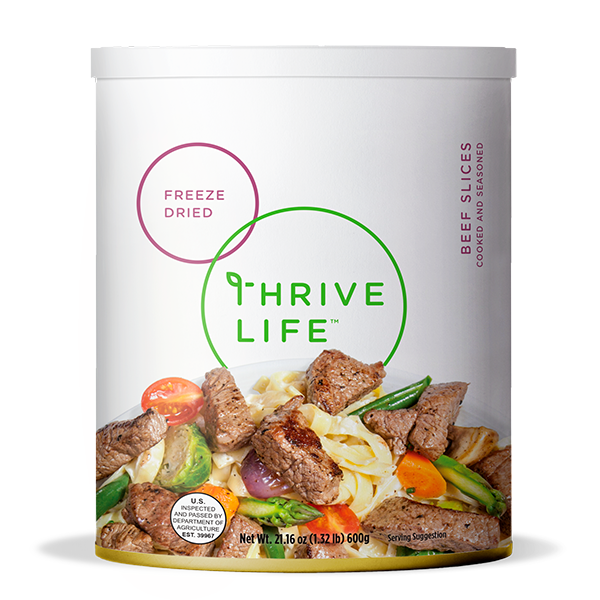 Thrive Beef Slices are freeze-dried to lock in the freshness and taste of the premium beef flavor and nutrients. The innovative freeze drying process removes all of the moisture from the prime cuts of meat giving each beef dice a shelf life of up to twenty-five years. By using Thrive Beef Slices you will save time because you won’t have worry about thawing, trimming, or browning each cut of meat. You can simply toss it into all your favorite meals such as beef stew, stir-fry, stroganoff, fajitas and enchiladas. Add 1/2 cup water to 1 cup Beef Slices; cover and let sit 15-20 minutes or until tender. Use in crockpot soups and stews, pasta sauces or toppings, and casseroles. Beef Slices are cut larger than our Small Diced Beef, making them better for entrees like BBQ beef sliders that need bigger chunks.